It may not ever come to anything but happened to notice when the Mets today moved to claim lefthanded pitcher Jay Marshall off waivers from the Athletics. 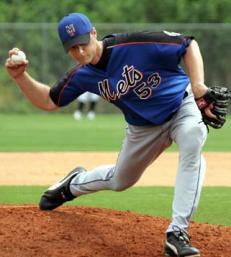 Marshall, a true submariner in the Chad Bradford style, continues a trend among Omar Minaya’s Mets teams to include or at least invite a few trick pitchers to camp each year. Marshall this spring will join the lefty-righty siderarm tandem of Pedro Feliciano and Sean Green (and another candidate with an unusual offering, knuckleballer R.A. Dickey). There was Joe Smith and Bradford before that, and guys like Steve Schmoll and Shingo Takatsu were given a shot. Is this a good thing? I’m not entirely sure. While Feliciano has become one of the Mets’ best weapons vs. rival lefty sluggers and Green and Smith often got grounders when they needed them I’d prefer sometimes they could achieve these successes without also tempting the Mets to try and solve all their problems with matchups and specialists. It can grind games to a halt, for one thing, and all seems so delicate: One specialist springs a leak, and suddenly the whole ship is sinking. We’ve seen it before. On the other hand, sidearmers are fun to watch when they’re going well and the Mets’ desire to bring these creatures in house indicates some evidence they have a plan, and I like that kind of reassurance. At any rate, surely we’re in a Golden Age for Met sideslingers. I barely remember a one from my childhood when guys like Kent Tekulve, Elias Sosa and Dan Quisenberry were someone else’s property. David Cone was known to get sideways occasionally, and Jeff Innis was a durable middle-inning submariner for a long stretch, — and there was Jesse –but I’m going blank after that, although I’m sure I’m overlooking a few. Little help? The Mets following a rare spring training victory today said Aaron Sele and ‘Bazooka’ Joe Smithwould be added to the big-league roster, a development that threw the Metly future of Chan Ho Park 61 into question. As things shake out it’s come down to Park, Ambiorix Burgos 40and optionless/hapless acquiree Jon Adkins 39 for the seventh and final bullpen slot; The Mets will go with four starters the first few times around before recalling Mike Pelfrey 34 to become the 5th starter. That may prove to reward precocious prospect Lastings Milledge 44 for a strong showing this spring seeing as outfielder Ben Johnson 4 was cut today (along with lesser hopefuls Mike Carp 64, Lino Urdaneta 68, Anderson Hernandez 1, Ruben Gotay 6, Mike DiFelice 30 and Sandy Alomar Jr. 90). Spring leaders of the Ring-Bell for Adkins-Johnson trade are the Padres, who’ve gotten a 0.90 ERA out of Heath Bell thus far. Word from the Daily News is the Mets will commemorate Smith’s promotion by slashing his uniform number in half, from 70 to 35. Ironically, that’s the same number they tried to assign to last year’s righthanded submariner, Chad Bradford, before Bradford fled for the quirkier 53.Troublingly, that’s also the number rosters list Sele as wearing, unless Sele switched while I wasn’t looking (entirely possible). Any help? Thanks. Thanks to eBay fiends Gordon, Pete and Jason who all shot us a copy of a Cubs scorecard up for bid on E-bay from the final series of the 1973 season, confirming long-held suspicions that Bob L. Miller wore No. 30 in his second go-round with the Mets. Miller was an original 1962 Met and the team’s first wearer of the No. 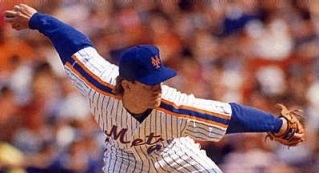 24 jersey but was cashiered after a 1-12 season for what one writer cracked was “half an infield” — Tim Harkness and Larry Burright — only to go on to a pretty fair career as a reliever for eight more teams and 11 more years before returning to the Mets in a waiver deal for the final two weeks of the 1973 season. By then, his No. 24 belonged to Willie Mays. As the Winter Meetings begin and the possibility of seing the Mets’ first-ever No. 75 are high, the Mets welcomed back Tom Glavine 47 and bid farewell to free agent Chris Woodward 4, Cliff Floyd 30, Steve Trachsel 29, Chad Bradford 53 and Roberto Hernandez 39. Of these men, we’ll obviously miss Floyd most of all, whom we wouldn’t have guessed would grow so Metly when he arrived in the Winter Meetings four years ago. The Mets are also expected to name a third-base coach shortly, seeing as Manny Acta 3 a few weeks back was named manager of the Washington Nationals. The Mets reportedly are considering Howard Johnson and Gary Carter, among others, to take Acta’s role. Veteran longshot pitcher Jose Lima arrived at Met camp boasting that he never wears the same suit twice. Apparently he’s applying the same rules of fashion to his Met jerseys. Lima on Saturday suited up No. 17, his third different Met jersey this spring. Lima, you will recall, was issued No. 99 and then spent an afternoon in 42 before the Mets thought better of reissuing the mothballed Jackie Robinson uni and gave him 99 back. In the meantime the Mets sold Dae Sung Koo back to Korea, freeing up 17, in which Lima appeared most recently. For a guy the Mets are likely to bid “auf wiedersehen” to in a matter of weeks, he’s kept things interesting on the runway. (Thanks to MBTN reader Jason for the tip). Jason also reports that coach Jerry Manuel appeared in No. 35, solving the mysery of what number he fled to after Chad Bradford claimed his 53 (below). What number remains for World Baseball Classic-exiled reliever Jose Santiago is still unknown (as is the question of whether he’s actually coming back after the tournament is complete). Santiago earlier this spring lost his assigned number 33 to teammate John Maine. More updates and intrigue from St. Lucie: Weepy veteran Bret Boone yesterday turned in his No. 9 jersey and retired. As pictured at left, Chad Bradford was spotted wearing 53, not 35 he was initially issued: That makes sense given his previous stops in Boston and Oakland, but it means a change for coach Jerry Manuel — only to what we’re not sure (thanks Matt for the photo). Readers also checked in with their best guesses as to Jose Santiago’s elusive jersey number: Using the process of elimination, one enterprising guy guessed either 52 (though we wouldn’t be surprised if Manuel shows up with that one now) or 87 — all others with the exceptions of 8, 24, 31 and 69 have been issued, with three of those numbers in semi-hibernation. One possibility we’ve realized by now is Santiago in the 35 we previously thought belonged to Bradford. The Mets made a curious trade Jan. 21, sending Kris Benson 34 and his mouthy wife to the Baltimore Orioles in exchange for relieverJorge Julio and pitching prospect John (Lobster) Maine. Whether this move portends a trade forBarry Zito or simply shifts the overpopulation problem from the starting rotation to the bullpen remains to be seen. Julio wore No. 50 last year with the Orioles while Maine in his brief appearances wore 61. On Jan. 18, the Mets signed former Ham Fighter and Tokyo Giant Yusaku Iriki (You’re So Fine), who looks to compete for the longman job. Iriki wore No. 49 with the Ham Fighters and No. 20 with the Giants, research shows. We overlooked the late December addition of lefty sidearmer Mike Venafro. He has a minor league contract and spring training invite. Photos from the Mets Caravan revealed players in new unis including Julio Franco in 23, Paul LoDuca in 16 and Jose Valentin in 18. Newly arrived reliever Jorge Julio was wearing a jersey withno number on it. MBTN reader Rich reports: Chad Bradford appeared in No. 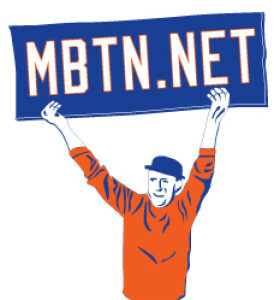 35, Duaner Sanchez in 40, and Mets.com is selling Bret Boone jerseys bearing No. 9. Additional photos show Xavier Nady wearing No. 10 and Steve Schmoll in the dreaded No. 46.